When thinking about traveling, most people picture it as the most exciting thing that can happen to them and the one activity that fulfills them. Traveling can boost one’s energy levels, confidence, their desire to explore the world’s beauties, to get to know new people and their cultures and many more. Traveling is recommended for everyone, from toddlers to seniors, as it can make one feel alive. In spite of all that, some trips can turn into nightmares if you forget to pack the necessary requisite, accessories or clothing. When traveling to a new destination, it is essential to do a bit of research and think about the things that will be useful during the trip, depending on the weather conditions, road conditions and the activities that you will have. Having all of these planned out from the beginning will help you avoid unpleasant situations. The main purpose of a travel vest is to fit in as many objects as possible in a secure and comfortable way. Most such products are designed for men and have a design that is quite bulky, yet practical and comfortable to wear. Imagine that you must visit an entire city and fit everything that you need in just one or two pockets. It is not only impossible, but also extremely annoying. 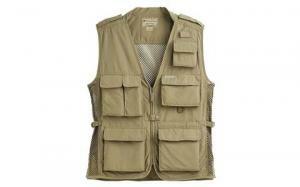 Lately, the travel vests that are available on the market are more comfortable than older models. They come with practical designs and are usually made of materials that allow you to feel comfortable the entire day. If you are already looking for the best travel vest for your needs, you will be delighted to know that we have reviewed some of the best-selling models on the market. While analyzing them, we have looked at factors that can determine their high or poor quality and therefore, your decision to buy them. Take a look at the below travel vests and see for yourself which one of these 7 fulfill your requirements. SCOTTeVest is quite popular among travel vest manufacturers and has gained its popularity due to the advanced technology and design it uses when creating these articles. If you are looking for a premium vest, you really have to take into consideration this model, too. It is a slim vest that comes in 3 colors: black, cadet blue and cement, it has 16 pockets and uses the special weight management system that most of the manufacturer’s vest have. It is made of lightweight poly fabric, it offers a stylish look and it comes with special pockets that are meant to protect you from identity theft. The RFID blocking pocket blocks all devices from stealing personal information from your documents, using a material that blocks 13.56 MHz frequencies. Also, it has a pad pocket that fits both Android tablets and iPads. The rest of the pockets are suitable for phones, wallets, sunglasses, electronic devices such as a camera, leashes, keys, e-books and more. If you want a lightweight, classy travel vest that will not put pressure on your back no matter how loaded it is, then this is the best choice for you. 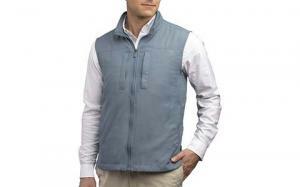 The ScotteVest is probably the most popular men’s vest on the market. It comes at an affordable price, giving the multitude of advantages it has and its thin design that makes it look amazing. 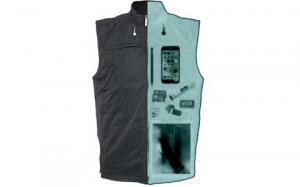 This is a gadget-friendly vest that can be used for professional purposes and traveling. It has no less than 26 pockets that are suitable for phones, tablets, cameras, e-book readers and so on. This is the best vest that you can find if your gadgets have a lot of wires and you they always wreck your nerves. This travel vest was designed in such a way that it is extremely lightweight, yet durable and perfectly balanced, so that its load will not affect your neck or back. One of the best things about this vest is its RFID enabled pocket that is meant to carry your passport and other important documents. By using it, you will be protected against identity theft while traveling internationally. If you agree to the fact that the more complex a travel vest is, the safer are your personal belongings, then you also agree that AyeGear has nailed it when creating this product. It is a high-quality, heavy-duty vest hat has a diamond membrane, a basic design and a lot of pockets and compartments where you can store your stuff. It has no less than 26 concealed pockets, so that you can keep your documents, money, cards and electronic devices away from thieves’ attention. So if you hate carrying a bag at all times and having to look after it whenever you sit down to have a coffee, then you will love this vest. Among those 26 pockets, there are 2 that are touch sensitive, so you can use your smartphone without having to take it out. Also, it has 2 large pockets with zipper closure that are suitable for tablets. More than that, it has earphone routing, so you won’t have to untangle them every time you take them out of your pocket. Design-wise, it has two layers of fabric, it is breathable, waterproof and windproof, it has a retractable reel and an elasticated band. It is easy to wash and it will not lose its durability due to exposure to water or wind. Therefore, if one of the 6 sizes it comes in suits you, go for it right now. ScotteVest brings to the market a model that is similar to the previous one, but this time it is designed especially for women. 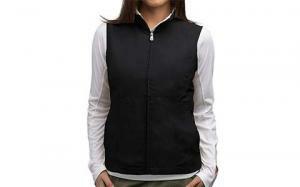 With a thin and slim design, this travel vest looks amazing and comes in black, red, grey, khaki and green. It is extremely lightweight, comfortable to wear and gadget friendly. If you are planning to go on a trip and take plenty of electronics with you, this is the right vest to carry them in. This travel vest has 17 pockets and it is designed to help you organize your devices’ cables, so that you feel comfortable while walking or when searching for something in your pockets. One of the great things about this vest is its padded pocket that is suitable for iPads or other tablets. It is oversized and it can keep any sensitive device safe. Something else that you will love about it is its wrinkle-free fabric that makes it ready to wear at any time. If you are looking to buy a travel vest that is more affordable, you should consider buying this product. It is made 100% of nylon, it is a lightweight piece of equipment that can be worn in any situation and it has a durable design. It comes with a mobile phone pocket, a map pocket, a water bottle holder, a pocket that is especially designed for your passport, as well as an iPOD pocket. In order to make it even more comfortable to wear when loaded, the manufacturer added shoulder padding that is meant to reduce the tension of the weight. More than that, the vest has interior shoulder grips that are made of rubber and adjustable side tabs. The fabric is water repellent and stain resistant. Also, it dries incredibly fast, giving the NyLite fabric. If you are traveling in sunny areas, this travel vest is ideal for you, as it protects you from harmful UV rays thanks to its UPF 50+. This travel vest is way more affordable than the previous models in our list, yet it is a simpler model. If you are looking for a travel vest that is comfortable, thin and suitable for long walks during your trips, this could be a great product for you. It has 12 pockets, out of which one is a hidden passport pocket, it is made of a combination of cotton and polyester and it can help you carry everything that you might need while traveling internationally. This product comes in black and khaki and can be worn by both men and women as it has a neutral design that looks good on everyone. It is a great travel vest if you care about wearing something nicely designed while exploring new destinations, yet it does not have as many pockets as other similar models. Also, it does not have RFID protection, but it comes with a pocket that is especially designed to hold your documents in a secure way. This is yet another travel vest that looks amazing and is very comfortable to wear during long trips, while carrying plenty of devices and objects with you. It is fairly priced, it is made of nylon, it is abrasion resistant and comes with sun protection. It can be worn during long hikes, fishing or long walks in complex destinations. This vest comes in three colors that you can choose from: green, white and grey. This vest does not have as many pockets as other travel vests, as it only comes with 3 interior pockets, two hand pockets and other small ones. However, it has other advantages that cannot be ignored. It is made entirely of nylon and has some mesh panels. Also, it includes the omni-wick technology that helps your body remain dry and comfortable even when the temperatures outside get really high. Overall, this is a lightweight, beautifully designed travel vest that is suitable for everyone, but probably not the best model for you if you are a gadget enthusiast, as the number of pockets that it has only allow you to carry a few objects. Why having an RFID protected vest could save you a lot of trouble? You don’t really know what a messed up vacation is until you lose important personal belongings such as your documents. If you never owned a high-quality vest for traveling, you should know that they are especially designed to help you keep all your stuff safe in one place. Instead of carrying a bag with you at all times and having to search for the things you need, you can access everything quickly, thanks to the large number of pockets. The best thing about this piece of clothing is that most of the pockets are secured, so you eliminate a huge stress from your life. It is almost impossible to lose something important thanks to the advanced design of travel vests. Some of the best models have RFID pockets that protect you from identity theft. This means that the frequencies of the devices that thieves use to steal your personal data are blocked. Infrared technology is used to achieve this kind of blockage. You might think that these things only happen in action movies, but the truth is that a large number of tourists all around the world are confronted with this issue. As you already know, it is easier to prevent something than to solve it. In today’s reality, anyone can become a victim of identity theft, so the same applies in this case. Is a travel vest really worth it? In today’s world, everyone sells everything, so it becomes really difficult to differentiate between the things that you really need and the ones that you simply want, only because they are available to everyone. A high-quality travel vest with a weight management system and a large number of pockets is one of the things that really make your trips more enjoyable. The little things that cause a lot of stress, such as the lack of space in your small shoulder bag, the lack of safety features and the lack of comfort instantly vanish when deciding to wear a travel vest. The answer to this question is quite simple: yes, it is totally worth it. You can carry your electronic devices with you without having to deal with the tangled cables, you get to carry the small objects that you don’t want to leave in your hotel room and you have enough space for any useful personal items such as your keys, headphones, documents, phone and more. How will a weight management system make your trip better? A weight management system is a great feature of the best travel vests. Such a system is meant to avoid back pain and discomfort during your trips. The purpose of traveling is to explore, to discover new places. Therefore, it implies a lot of walking. If the bag that you are traveling with doesn’t have a design that comes with WMS, you might feel a lot of pressure on your back. Vests that come with a balanced design protect you from being affected by the weight you are carrying. 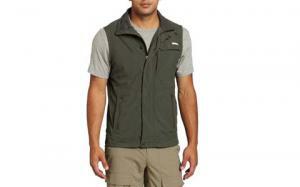 Travel vests are essential pieces of clothing that can turn your trips into comfortable and enjoyable journeys. Choosing the right model for your needs is crucial, yet a vest that has a large number of pockets is not necessarily the best for your needs. When choosing a travel vest, think about your general behavior and whether or not you need that many pockets. If you are one of those people who only brings their phone and wallet with them, you will be annoyed by so many pockets. On the contrary, if you like to have everything at hand, such as maps, water bottles, food, all sorts of accessories, camera, Go Pro camera, tablet, notepad, iPod and many more, then you certainly need a travel vest that is complex and filled with pockets. One of the most important things that you should consider when choosing such a product is the design. The load of such a vest is usually high, which means that you could get tired easily if the design of the vest is not able to balance the weight correctly and efficiently. Your shoulders, neck and upper back could get tense and sore and you will want to get back to your hotel room after only half a day. Although travel vests seem to be basic pieces of clothing, they get better as they integrate advanced technologies. RFID pockets, for instance, have the ability to protect you against identity theft and protect your personal information no matter where you are. If you are traveling in destinations with intense traffic and you are worried about the safety of your data, you should definitely choose a vest that integrates such technology.